Shake for 5 seconds with two ice cubes (a/k/a the Tiki shake) and strain into a tall glass. Fill with crushed ice and add a straw. 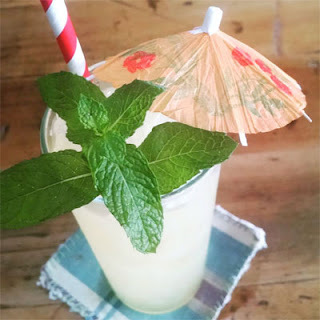 Garnish with a mint sprig and either a paper parasol or 2-3 dashes of Peychaud's Bitters (or both). Two Sundays ago, Loyal Nine held a Lewis Carroll "The Walrus & The Carpenter"-themed event and I created a six drink cocktail list named after lines from the narrative poem. One of my ideas was a tequila-based Hurricane riff that got named after the line "Hopping through the frothy waves" and subtitled on the menu as "A Hurricane coming off the Gulf of Mexico." I first tried it with lime juice to complement the tequila better but it ended up distracting from the passion fruit, so the original's lemon was the correct answer. To lighten, sweeten, and add light herbal notes to the profile, I opted for a bit of Dolin Blanc Vermouth. We had plenty of paper parasols for the party, but once this drink was bumped to the regular cocktail menu, we swapped it for a Peychaud's Bitters garnish to add some color and intrigue to the top of the drink.